Providing excellent support for our clients is very important to us at TouchPoint, and we work extremely hard to provide the best support we can. Please see our support protocol that works very well and allows us to answer you very promptly. My Data users can also use the Help link and Contact Support. However, these types of requests are sent to the System Admin for your church with our support team copied on the email. This is so the System Admin for the local church can answer the person’s question. If the Admin needs help, he can let us know and we will be happy to assist him. Contacting us for support always starts with an email, after you have used the Help Documentation to try to find the answer to your question. If you do not find the answer, use the Contact Support feature that is built in to every database. So, let’s look at where to start when you need help. Please see the article listed below regarding our TouchPoint Documentation - how to access it and how to search for what you need. If you do not find the answer to your question the documentation, return to the previous tab of your browser and follow the simple steps below. If you have several questions about different types of issues, please submit a separate request for each topic. This helps us focus on one question at a time and get a response back to you as quickly as possible. Also, once your receive a reply to an answer, instead of replying to us and asking another question about something different, go ahead and submit a second request. Following these simple principles will help us provide much better support for you. Select the Contact Support tab. - Subject - Enter a few words to let us know what this request is about. - Select the appropriate Urgency using the drop down menu. Please do not select “Emergency. I need help ASAP” for every request. Use this for true emergencies. - Type your request in the body of the email. Please be specific - giving us names or organizations so that we can troubleshoot effectively. The more information we have at the start of the request, the quicker we can resolve your issue. - CC If you want to copy anyone else at your church, enter their email address in the CC field above the body of the email. You may enter multiple addresses, separated by a comma. 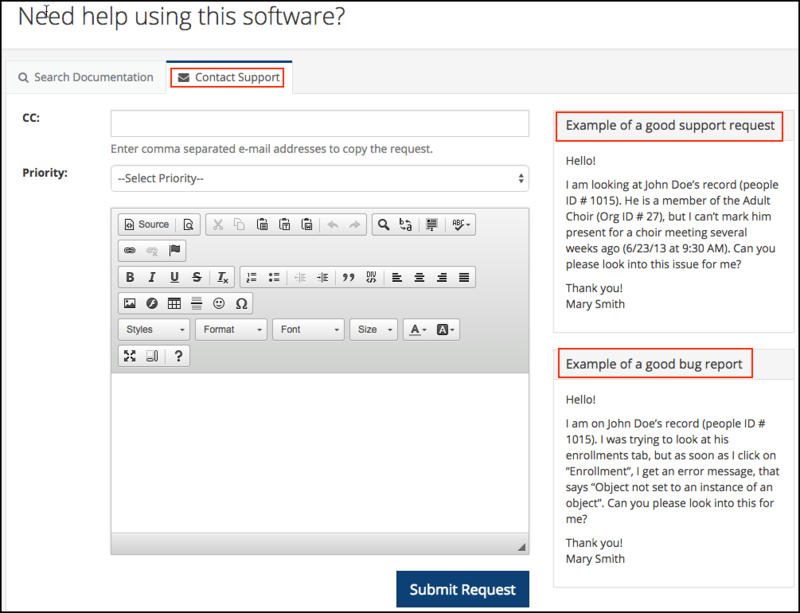 A copy of your support request is automatically sent to the AdminMail address that is in your church’s Settings, so it is not necessary to copy that person. After you click Contact Support, and before you submit your first request, notice the examples. Example of a good support request and Example a good bug report . These are there to help you format your request or bug report, so that you give us the information we need to quickly give you the help you need. Once you are satisfied that you have provided the information we need, just click the blue Submit Request button. You will receive an email confirmation letting you know that your request has been received and that someone will get back to you shortly. Also, an email will be sent to the Admin (the email in the Admin Email Settings) at your church, letting that person know that you have a question and have asked for help. You will receive a reply from a support team member as quickly as possible. as well as the information you enter in the body of the email. That information saves us so much time in accessing your database, and lets us know immediately if the problem is simply that you need to be given an additional user role, for example. It also allows the team members to ‘claim’ the request, so we know who will answer you. This is why you always want to contact support using this method, not by emailing directly. This is the most efficient way for you to get the support you deserve in a timely manner. Sometimes people just ask us to give them a call. This is not the most efficient use of our Support Team’s time or yours. By submitting a Support Request giving us information about what you are having trouble with, we will be able to research what’s going on and most of the time our email reply will be all that’s needed. Frequently, we will also include a link to the help article that relates to your questions. We are able to answer emails at times when we may not be able to get on a phone call. For example: During an online training session or demo, one of us may be available to answer your email while someone else on our team is doing the talking on the call. During those times, we would not be able to take a phone call and you would have to wait much longer to get an answer. If necessary, after that initial request, we will suggest scheduling a GoToMeeting phone call. We will do this if we need to demonstrate something for you or if the issue requires discussion. When you reply to an answer, be sure to click Reply to All so that all of our team will receive your email. This helps us stay in the loop and ensure that you receive any follow-up answers promptly, even if the original support person is busy.